I get the first part — keeping thousands of jobs within the city. I do hear that many of the 3,100 don’t live in the City of St. Louis — they aren’t thrilled about driving to North City. But, it’s the second part that I don’t get — how does putting many acres behind chainlink fencing help those outside the fence? 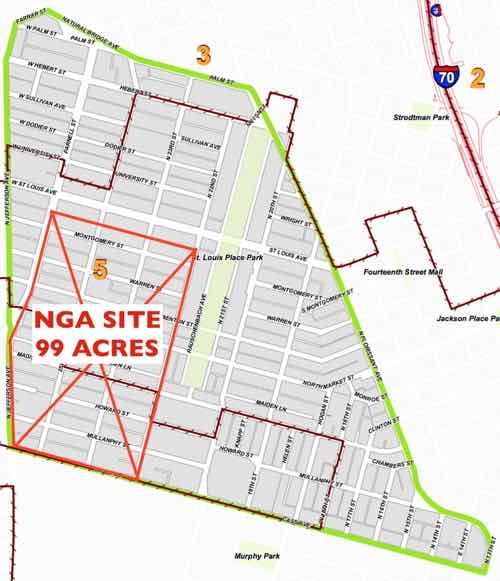 The NGA will take a big chunk of the St. Louis Place neighborhood. Once open, the NGA will be like the current site. Thousands will drive there, do their job, drive home. They won’t be running outside the barbwire fence to grab lunch. An employee living in, say Arnold, isn’t suddenly going to move to the neighborhood. A high-security government spy agency will never be a neighborhood anchor. For those employees driving to work from Arnold, they currently drive 15.8 miles, about 20 minutes or so each way. The new location will be 20 miles, roughly 30 minutes or more. For others, the commute to work will be shorter. The best we can hope for is its presecence convinces others to consider relocating to the former Pruitt-Igoe site, South across Cass Ave. MetroBus might improve frequency to the area…might. Jefferson Ave & Cass Ave both need to be updated — fewer & narrower lanes, new sidewalks, crosswalks, etc. Sadly, our leadership still thinks razing block after block — totally erasing the street grid — is a positive thing to do. Is is 2016 or 1946? Washington Ave will be the first area to benefit. I expect some high turnover as a result of this decision. Older employees are less willing to make this ‘dangerous’ drive and will not relocate. They’ll be replaced by a younger generation. Let’s also remember that this project won’t be complete for another 5 years, so don’t expect new corporate entities or businesses until 2022 at the earliest. I agree that downtown may be the big winner in this in terms of housing preference of NGA employees. As for transforming the surrounding neighborhood, I don’t have high expectations but I do believe NGA in northside will enable McKee to get more financing for other projects. For example, I wouldn’t doubt a modest housing initiative will be announced soon as intimated. Overall, I don’t see how this development can be considered a negative and it certainly is better than nothing. It’s the same failed policy we’ve been repeating for decades — completely destroy emissive site by removing all buildings, street grid, etc. This will block access to public transit on Jefferson, users will need to walk around rather than directly on an intact grid. Your criticisms are certainly valid and I think it would be better to have something that would keep a city grid intact. Unfortunately there wasn’t anything better on the table. There were four total sites being considered. Because of our fractured region, the city must cling to every job. Even if that means wiping out 99 acres. We continue to make bad decisions because of past bad decisions. Will we ever break this cycle? I would have been better had the site been located atop the old Pruitt Igoe. The claim that site remediation would have been too expensive for this project is strange. How will it be better for the next project? Why not roll those costs into the government initiative? After all, it was a failed government policy that brought us – and left us with – Pruitt Igoe in the first place. Now the cost of fixing that mistake is encumbering any possible private investment. That part I don’t get. Meanwhile, your overall negative reaction is unfortunate. On balance, this is a good thing for St. Louis. I agree that past bad decisions (such as the great divorce) have influenced other bad decisions. I don’t agree with your characterization of this NGA result as a bad decision. Incremental progress can’t be stalled until conditions/situations/proposals are absolutely perfect. I would say that the result is the best the city could have hoped for given the area we’re talking about and the potential loss of jobs. The Oak Ridge National Laboratory is very different. It is set among trees, not an existing street grid. It is penetrable, not a fortress. The 3,100 NGA employees do spend lots in the region. The annual payroll is very important. Decades later their earnings won’t be spent within 1-3 miles of the NGA. I wasn’t aware that the lab campus is now penetrable. When I visited Oak Ridge 6 years ago, 12′ barbed-wire fences still surrounded most–if not all- the campus. (Tours, however, are conducted from June through September, so the site must not be as accessible as, say, a shopping mall.) So some sort of barrier between campus and city (if not physical, then psychological) does seem to exist. I question why you think that in the future, employees of NGA won’t be spending their money in the surrounding NGS areas. If lower crime, better schools, and affordable housing happen, there won’t be a reason for employees to commute. “Anchor institutions” (or better put – “community anchors”) are not limited to nonprofit institutions. True, but from the outside this will be similar to a prison — guards and barbwire fence. High-security facilities aren’t anchors. I agree this will in no way revitalize the area. That’s like saying Emerson is revitalizing Cool Valley and Normandy. Only the truly naive believe that. Workers will stay in their little bubble, period. I, too, think losing the street grid is unfortunate and should have been avoided. To see what their current facility looks like in Arnold, google Vogel Road and Theodore Drive and switch to streetview. Yes, it is secure, with fences. Yes, it is suburban in scale. No, it is not horrendous. We’ve been waiting for 50-70 years for this part north city to change direction, economically. The old city grid hasn’t been getting many takers, and certainly not many in the large-employer category. Doing nothing is an “option”, but one that won’t yield any significant results, in the foreseeable future. There will be many, many, many developable blocks of the old city grid still left, around the area, after this happens – getting a new, major, stable, employer, in the middle of it, might just change people’s perceptions and lead to, horrors, gentrification! To see what their current facility looks like in Arnold, google Vogel Road and Theodore Drive and switch to streetview. Yes, it is secure, with fences. Yes, it is suburban in scale. No, it is not horrendous. We’ve been waiting for 50-70 years for this part of north city to change direction, economically. The old city grid hasn’t been getting many takers, and certainly not many in the large-employer category. Doing nothing is an “option”, but one that won’t yield any significant results, in the foreseeable future. There will be many, many, many developable blocks of the old city grid still left, around the area, after this happens – getting a new, major, stable, employer, in the middle of it, might just change people’s perceptions and lead to, horrors, gentrification! I’ve been up in this area alot for work. Yes it’s sad to destroy the street grid, yes it’s sad that this project will literally be fenced off from the surrounding area. However what is there now is deplorable and mostly abandoned. There is evidence of some attempts at infill and nearly ALL of it has failed. I live in the city and would love nothing more than to see this part of town return to its old glory but that just isn’t going to happen any time soon. We can all agree that a suburban office park isn’t what North City needs but neither is another 25 years of decay. while i agree with your criticism about the anti-urban nature of the facility, St. Louis place is already gutted. i just don’t see organic development filling this area in our lifetimes without something to kick-start it. my hope is that the NGA, as an employment center for potentially 5000 people, will attract developers interested in capturing the increasingly younger segment of that workforce that wants a short commute and urban lifestyle. 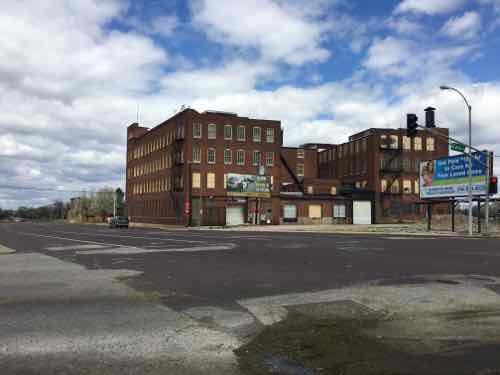 i’m not necessarily opposed to eminent domain here, but i think the government should be required to move the homes of those who want to keep their homes, and to move the Buster Brown factory across the street since it’s on the National Register (which is doable and for less than i would have expected). Is a street grid really worth anything if nothing is occupying the vast majority of space on the street? Isn’t just concrete with no purpose at that point?